A newly published study details how massive galaxies were formed by explosive star formation that was set in motion by the collision of galaxies a few billion years after the Big Bang. It has long puzzled scientists that there were enormously massive galaxies that were already old and no longer forming new stars in the very early universe, approx. 3 billion years after the Big Bang. Now new research from the Niels Bohr Institute, among others, shows that these massive galaxies were formed by explosive star formation that was set in motion by the collision of galaxies a few billion years after the Big Bang. The results are published in the scientific journal, Astrophysical Journal. Galaxies are giant collections of stars, gas and dark matter. The smallest galaxies contain a few million stars, while the largest can contain several hundred billion stars. The first stars already emerged in the very early universe approx. 200 million years after the Big Bang from the gases hydrogen and helium. Gas is the raw material used to form stars. These giant clouds of gas and dust contract and eventually the gas is so compact that the pressure heats the matter so that glowing gas balls are formed, new stars are born. The stars are collected in galaxies, the first of which are a kind of baby galaxies. As long as there is gas in the galaxy, new stars are being formed. The astronomers’ theory is therefore that the structure of the universe was built by baby galaxies gradually growing larger and more massive by constantly forming new stars and by colliding with neighboring galaxies to form new, larger galaxies. The largest galaxies in today’s universe were therefore believed to have been under construction throughout the history of the universe. “That is why it surprised us that we already when the universe was only 3 billion years old, found galaxies that were just as massive as today’s large spiral galaxies and the largest elliptical galaxies, which are the giants in the local universe. Even more surprisingly, the stars in these early galaxies were squeezed into a very small area, so the size of the galaxies were three times smaller than similar mass galaxies today. This means that the density of stars was 10 times greater. Furthermore, the galaxies were already dead, so they were no longer forming new stars. It was a great mystery,” explains Sune Toft, Dark Cosmology Center at the Niels Bohr Institute at the University of Copenhagen. The extremely massive and compact galaxies were not flattened spiral galaxies where stars and gas rotate around the center. Rather, they resembled elliptical galaxies where stars move more hither and thither and where the gas for new star formation has been used up. But how could the galaxies become so massive and so burnt out so early? How were they formed? To find out what happened, Sune Toft had to look even further back in time. Based on the ages of the galaxies, he knew that they had to have formed very early in the history of the universe, but at that point there was simply not enough time for the galaxies to have grown so massive through normal star formation. He had a theory that the massive galaxies were formed by the fusion of smaller galaxies, but that alone could not explain how they had become so massive so quickly and were already dead. The theory was therefore, that there must have been some especially extreme galaxies in the formation process. 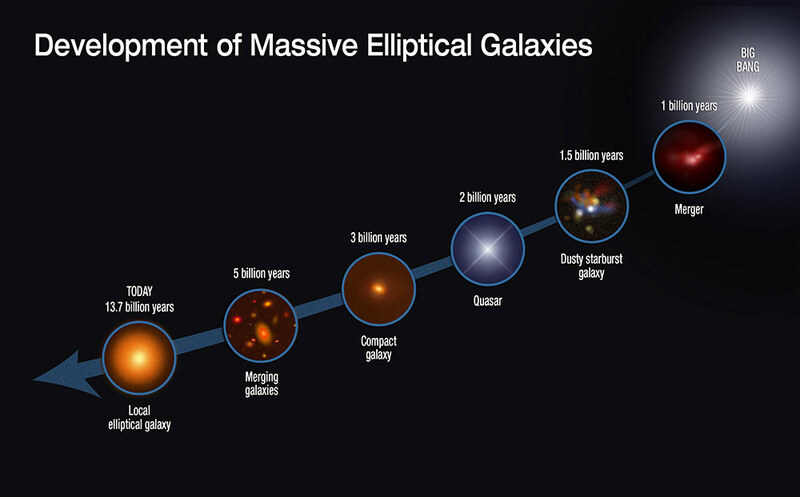 “We studied the galaxies that existed when the universe was between 1 and 2 billion years old. My theory that it must have been some galaxies with very specific properties that were part of the formation process made me focus on the special SMG galaxies, which are dominated by intense stare formation hidden under a thick blanket of dust,” explains Sune Toft. He explains that when such gas-rich galaxies merge, all of the gas is driven into the center of the system where it ignites an explosion of new star formation. 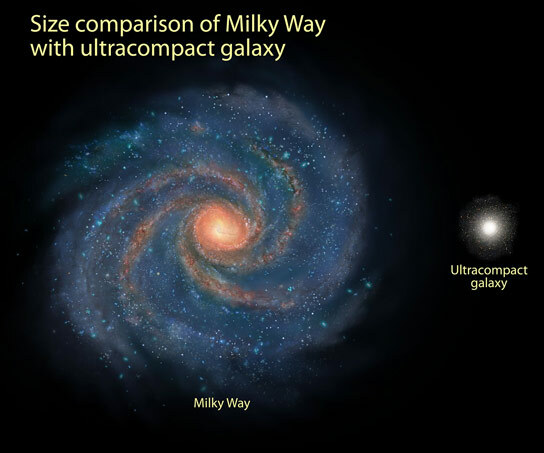 A lot of stars are formed in the center and the galaxy quickly becomes very compact. But with the explosive star formation, the gas to form new stars is also used up extremely quickly and then you get a dead galaxy. “I discovered that there was a direct evolutionary link between two of the most extreme galaxy types we have in the universe – the most distant and most intense star forming galaxies which are formed shortly after the Big Bang – and the extremely compact dead galaxies we see 1-2 billion years later,” says Sune Toft. The new research is a breakthrough in discovering the formation process of the enormously massive and dead galaxies in the early universe. Be the first to comment on "New Research Shows Early Galaxies Grew Massive Through Collisions"